Photos From a Surreal and Snowy Garden Soirée in Southwest D.C.
Who besides Atlas Obscura and Hendrick’s Gin would throw an after dark garden party in the middle of winter? Neither snow, nor ice, nor gloom of night can keep the Hendrick’s Grand Garnisher from its curious cucumber slicing responsibilities. So much was proven a few weeks ago, when Southwest Washington D.C. was dusted with one of its first snowfalls of the season. The 38-foot vehicle planted itself in front of the Blind Whino SW Arts Club, a former church reborn as a madly technicolored event space where guests danced and drank despite the dark and cold. The whole place shone brightly, like a type of rare, night-blooming flower. Fire dancers performed in front of the church’s gothic arches, bringing warmth and energy to the evening, while fire pits placed around the yard brought warmth and energy to guests sipping cooling cocktails in 20-degree weather. The Bee’s Knees, a three-piece act featuring a tuba, an accordion, and a banjo, kept things inside the space hot with cabaret tunes. Between sets, a dapper DJ spun old jazz records on a hand-cranked Victrola while a contortionist surprised guests by emerging from a hard-traveled steamer trunk. 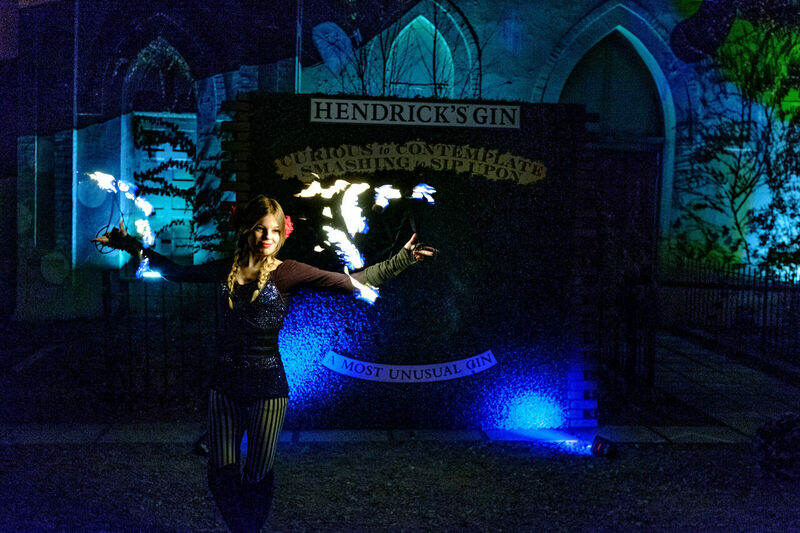 The night marked the final event in our ongoing series with Hendrick’s Gin. For those lucky enough to have joined in D.C., Atlanta, or Seattle, we were honored at your attendance. For those who missed the escapades of the Hendrick’s Grand Garnisher, make sure you keep your eyes on the horizon: You never know when a marvelously massive, bicycle-powered, cucumber cutting machine may come barreling down your street, ready to serve you a cocktail with a dash of unusual joy. Guests showed their hearty constitutions and thirsty countenances as they huddled around the hearth. A committed guest’s chilly wait was well rewarded. A lovely evening for a nighttime perambulation. Inside, a verdant, rosy Wonderland awaited. The walls bloomed with floral fantasy. Shipra Saraogi contorted and confounded. The evening was moody and magical as guests entertained each other with card tricks. A mad scientist is caught concocting cucumber Negronis. A final surreal set starring The Bee’s Knees. This post is promoted in partnership with Hendrick’s Gin. Follow the Grand Garnisher’s journey at Hendricks.com. Last weekend Hendrick's Gin and Atlas Obscura continued their series of cross-country garnishing galas. Hendrick's Gin and Atlas Obscura joined forces to celebrate summer. Take an unusual journey aboard Hendrick’s Grand Garnisher.